Saturday April 12th 1879. We girls did the work this morning and Mother went to town. Mollie Stevens and [Ossie?] Nelson came over for me. I started down to the valley about noon. I spent the afternoon at Aunt Ellens and went up to Grand-mothers before night. 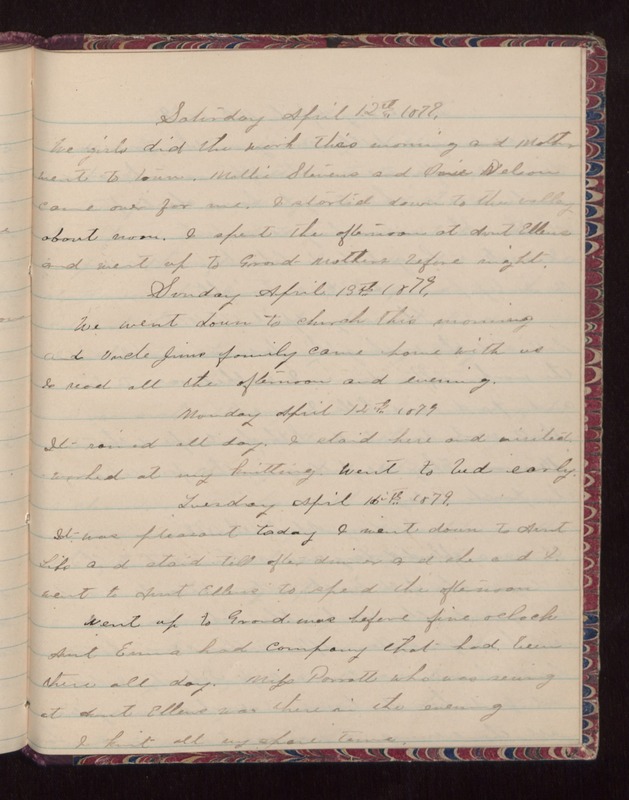 Sunday April 13th 1879. We went down to church this morning and Uncle Jims family came home with us I read all the afternoon and evening. Monday April 14th 1879 It rained all day. I staid here and visited. Worked at my knitting. Went to bed early. Tuesday April 15th 1879. It was pleasant today I went down to Aunt Libs and staid till after dinner and she and I went to Aunt ellens to spend the afternoon Went up to Grand-mas before five oclock Aunt Emma had company that had been there all day. Mifs [Parrott?] who was sewing at Aunt Ellens was there in the evening I knit all my spare time.